A full house gathered for art, appetizers, and anecdotes on Friday evening. 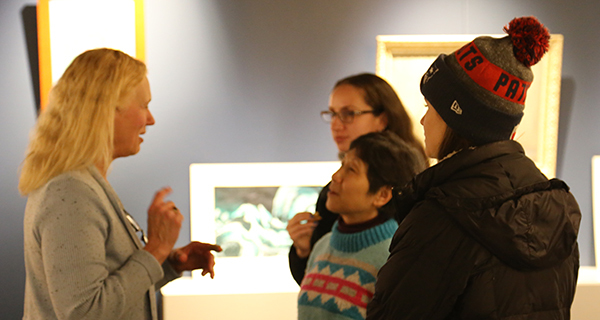 On the evening of Friday, January 25, Medfield TV hosted a reception for the opening of the Junghann family art exhibition. With Junghann sisters Julia and Diane in attendance, visitors enjoyed some light snacks and four walls filled with three generations of one local family’s art work. Milling about, visitors admired the art and each other’s company. The walls were covered in an impressive array of oil painting and water color canvases: forest paths cutting through towering spruce forests, lighthouses peering over rocky cliffs, bowls of fruit alongside pots of flowers, giraffes on the savannah, cactuses in a desert sunset, and even a Roman centurion peering pensively into the corner of the room. The family tradition of painting began when Earnest and Emma Junghanns immigrated to the United States in the 1920s. The couple bought a summer place on Indian Lake in New York, and Emma passed the time painting the silent landscapes of the Adirondack wilderness. She passed the tradition on to her son, George, whose wife, Joan, took it up soon after marriage. Both parents then inspired their daughters, Julia and Diane, to take up the family tradition. Three generations and untold brushstrokes later, the family’s many collected works hang in homes throughout the area. 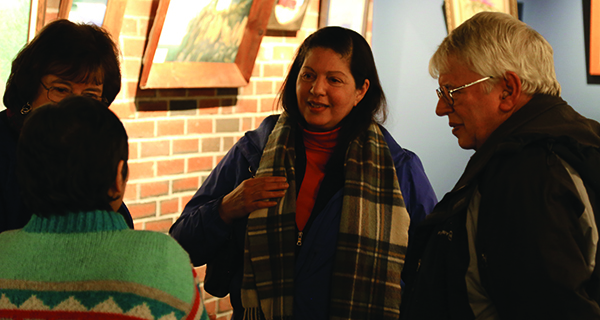 Diane greets visitors and shares stories of her family’s exhibition. The family’s talent is evident from the work hanging on the walls, but Julia and Diane explained that they think of themselves as students of the craft. The Junghann family exhibit will be on display at Medfield TV throughout the month of February.